27 July 2016, Wednesday. 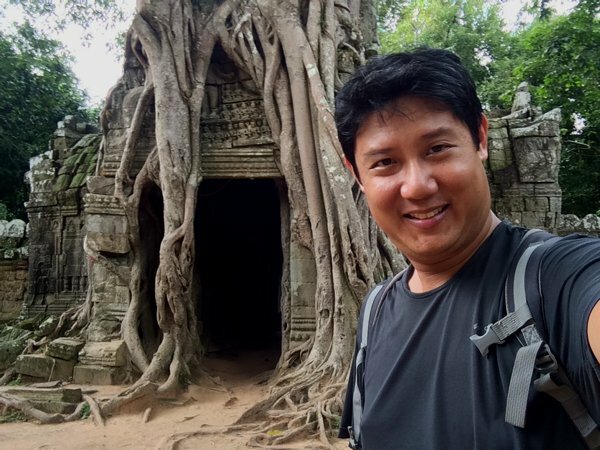 After breakfast, I set off towards Siem Reap, also known by tourists as the city of Angkor Wat. 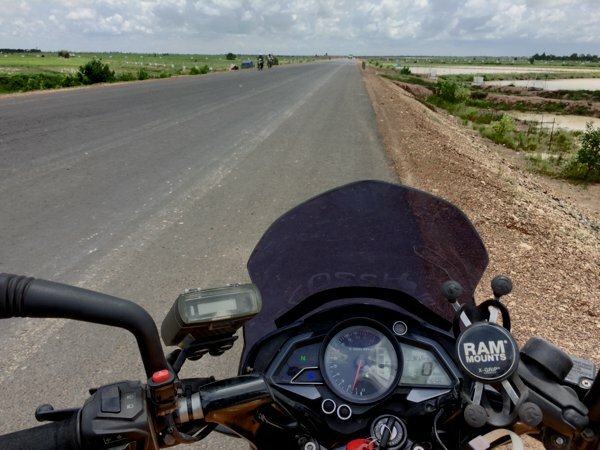 Except for the stretch between Laos-Cambodia border to Stung Treng, the roads in Cambodia are generally great to travel on. 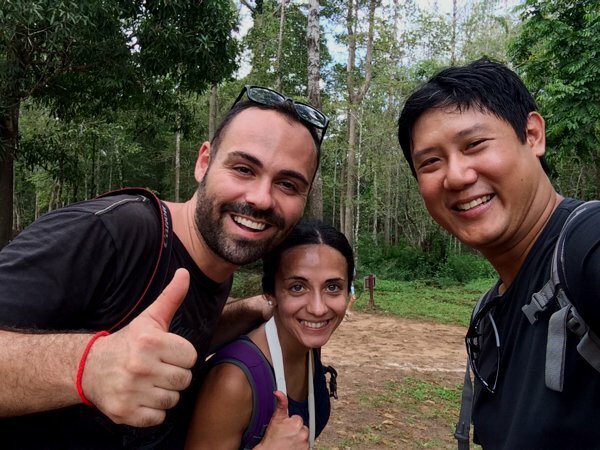 And Cambodia is really flat – you can almost see a 360 degree horizon. En-route, somewhere near Siem Reap, it started raining heavily. Actually POURING. Thankfully, I managed to take shelter in a roadside eatery before the skies opened. So I was mostly dry. 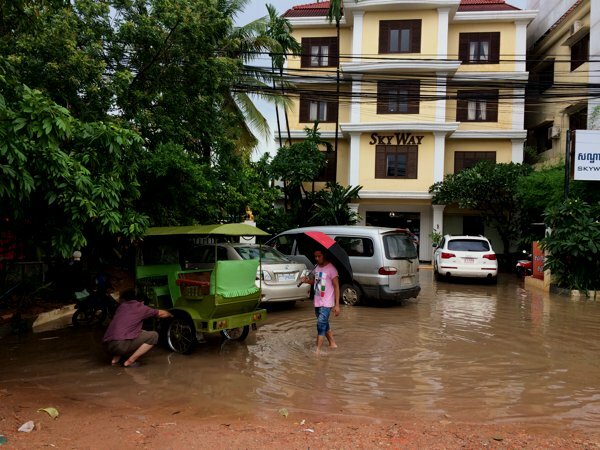 But when I reached Siem Reap, parts of the city was covered in floodwater up to shin-level high. Seeing the locals driving and riding through the waters, I figured the Pulsar 200NS shouldn’t have any problems doing that too. I did try to stay a distance from the front vehicle, and hugged the right side of the road – when I have to stop, I don’t want to put my feet down INTO the water. The kerb came in very useful to keep my feet dry. 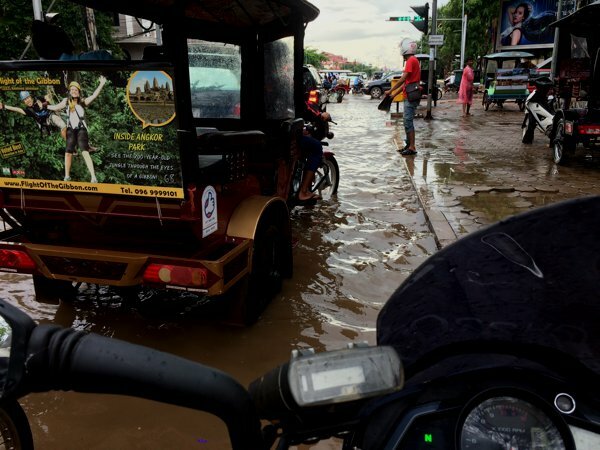 An opportunist washing his tuk tuk with the rain water. 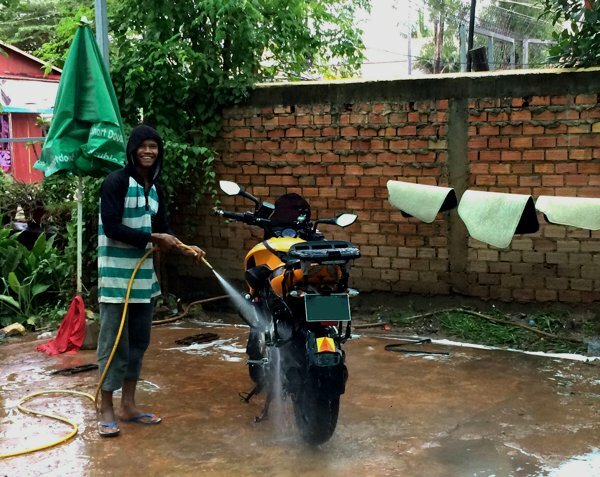 Bajaj Pulsar 200NS underbelly exhaust – tested in flood waters almost shin level high! No problem! Power to ride ahead! I felt like riding a motorboat instead of a motorbike for a brief moment. Hahah! Oh man! The kind of road conditions I get to ride through here! Lol! Went for a bike wash. The 200NS was getting real filthy. USD1. Found a nice room at Angkor Pearl hotel along Oum Khun Street for US$25 a night, and got decided to stay for 2 nights in Siem Reap. I went exploring around town in the evening, but was feeling a little exhausted after the long ride, so I decided to get an early night’s rest, and prepared for tomorrow’s long walks. 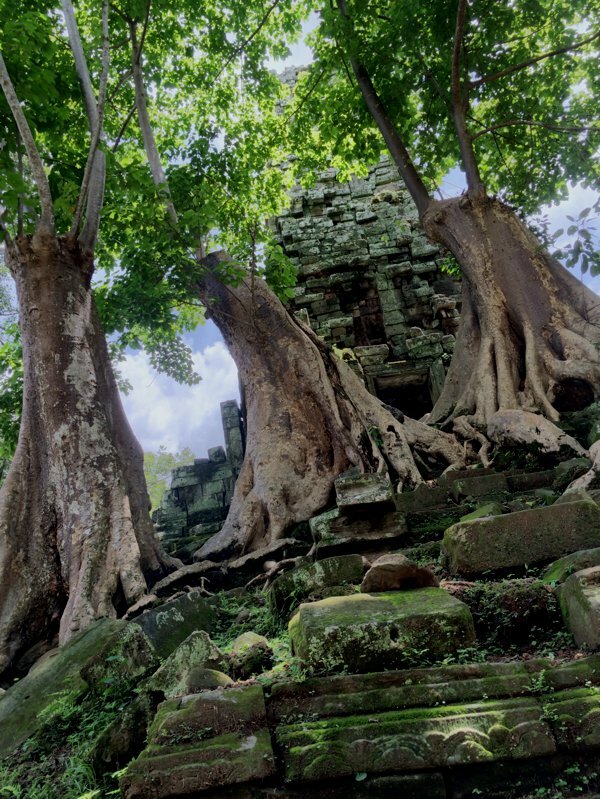 Nobody comes visiting Siem Reap without a visit to the Angkor Archaeological Park – home of the world-famous and mystical Angkor Wat. 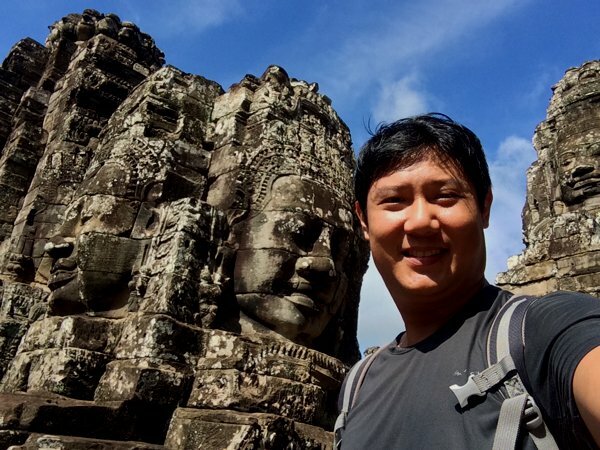 sgBikerBoy is in Angkor Wat! 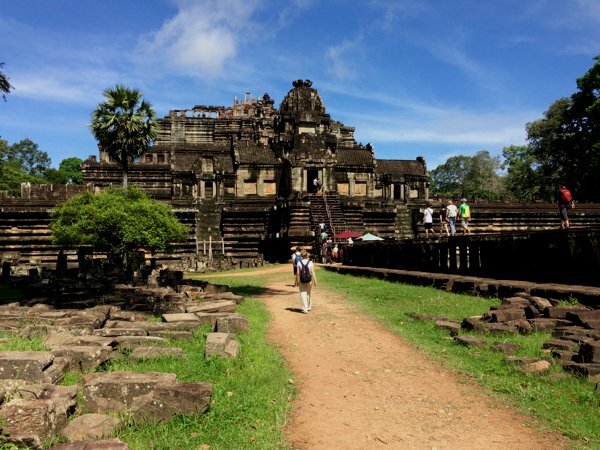 Angkor Wat and the surrounding monuments have been heavily documented. 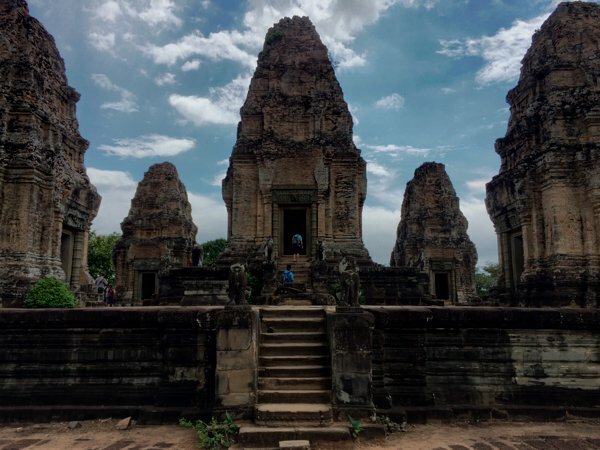 And so I will not attempt to describe the ruined temples, monuments, and history of the place (which I probably have either very limited knowledge of, or worse, erroneous information!) What I WILL do, is to describe my experience GETTING THERE and RIDING within the archaeological park. First, you need tickets to enter the temple grounds. Day passes are US$20, 3-day passes go for US$40 and 7-day passes are US$60. 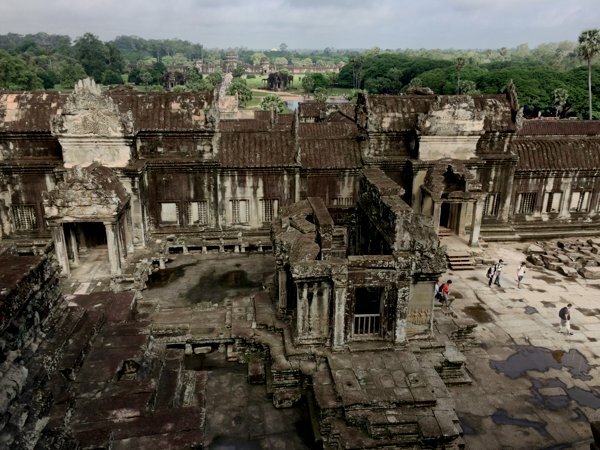 The old ticket office on the main road leading to Angkor Wat is permanently closed. The new ticket office (GPS 13.376592 103.879935) is a somewhat out-of-the-way 4km away. For US$20 a pop, I suspect that they’ve raised enough money very quickly to build a spanking new ticket office. The new office also has a huge parking area to accommodate the buses ferrying tourists to the Angkor park. I bought the 1-day pass – probably the most expensive attraction I’ve paid for in this trip. You need to have your photo taken by a webcam (they all seem to use the Logitech c920 here), and then you’ll get a ticket pass with the valid dates and your photograph printed on it. 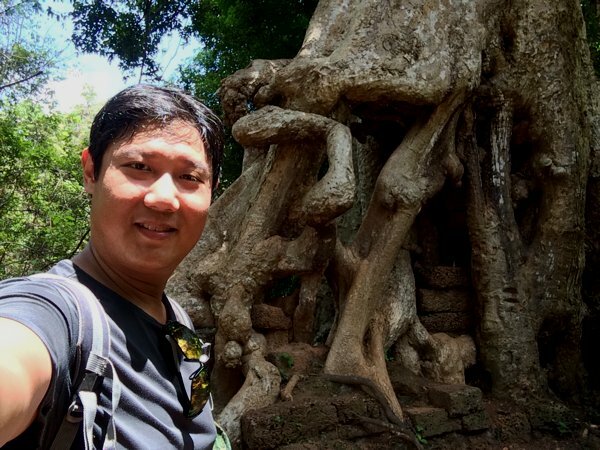 As I’ve read conflicting reports about taking a foreign-registered motorcycle into the Angkor Archaeological Park grounds online – some say can, many say cannot; some say it needs to have a Cambodian registration plate; some say it needs to have a Cambodian driver, and even tourists on a Cambodian-registered rental cannot get in; and some say that “big bikes” cannot go in, only “small bikes” can. I tried asking the hotel staff about it, and they too mentioned about the “big bike cannot” and “foreigners cannot” ride inside the park. As there seem to be no consistency in information, I decided to go ahead and take my Pulsar 200NS in (hey! 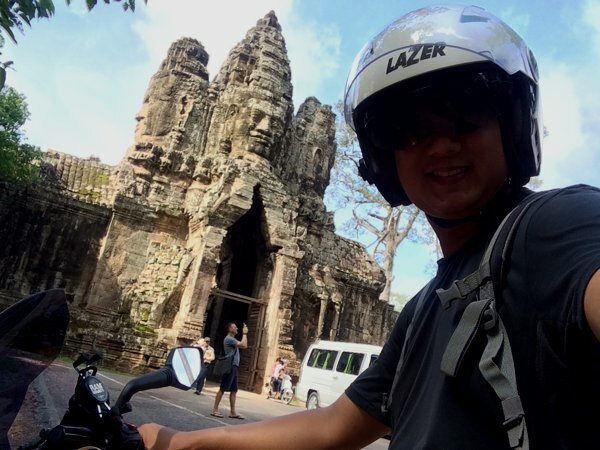 It’s not that strange a bike here – you can find the Pulsar 200NS in Cambodia!) And if I do get turned back, I’ll just hire a tuktuk to take me around. The first place I searched for clues on the possibility of riding into the park was the ticket office. They seem to have the rules and regulations of park visitors printed on the wall. Proper attire, no spitting, no talking loudly, no destroying of monuments, blah blah blah. Nope! No mention about motorcycles. Okay, some hope there. To maintain a smaller profile to get around the “only small bikes can enter rule”, I removed my side- and top-boxes. Just me, my Pulsar 200NS, and a haversack on my back to carry water, sunshades, sunscreen, a little snack, and some other essential stuff. Rode up to the archaeological park and hoped for the best. I was expecting a border control of some sort. There didn’t seem to be any proper border control, except for some sentry posts along the way. All the locals seem to be riding through it without stopping and the border guard was sitting lazily, seemingly uninterested. I thought I heard a whistle blow, way AFTER I’ve crossed that “border”, so I just ignored it and rode on. Hey! If you wanted to stop me, stop me BEFORE the border, and not AFTER. I don’t have eyes behind my back. 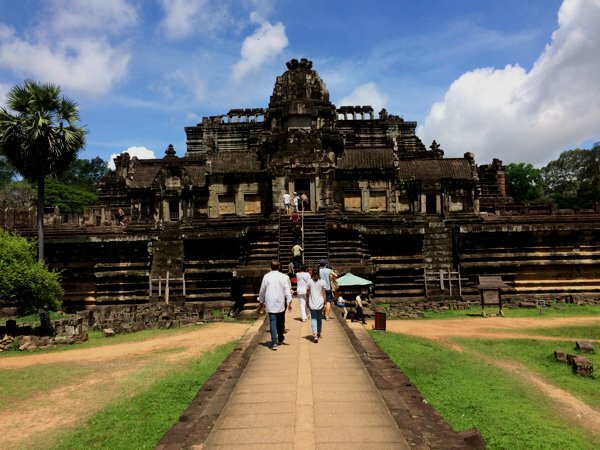 First stop, Angkor Wat. Rode up to the parking area and before I could enter, I was stopped by a border guard. This time, he was waving frantically at me, seemingly concerned that I wouldn’t see him. I whipped out my valid ticket. “Okay. No problem. Thank you. Please enjoy.” And he handed the ticket back to me. No mention about the bike. Throughout the day, as I was visiting the various temple sites, I was stopped multiple times to check on my ticket. Trust me, the people here are extremely zealous with ensuring that you have a valid ticket. I think there is a US$100 fine should a foreigner not possess a valid ticket. 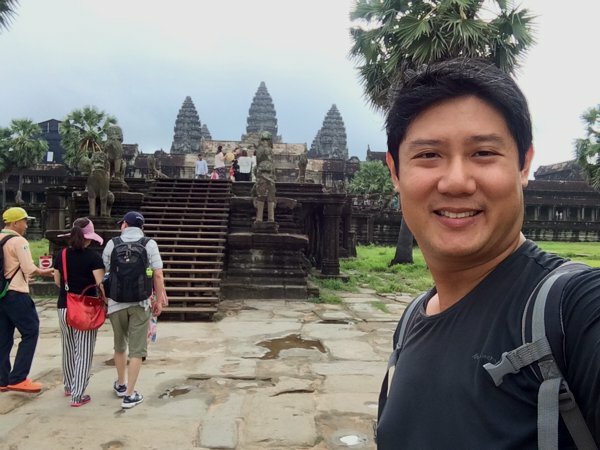 Cambodians get to visit free. It seem that as long as I hold a valid ticket, everything was okay. No mention of my bike, ever. As usual, I was stopped and asked for my ticket. After examining my valid ticket, he pointed to my motorcycle, and my heart skipped a beat. “Oh, a brand new one goes for around USD3,000 in Phnom Penh.” I replied. He nodded approvingly, smiled, and waved me on as he continued admiring the bike. And for the rest of the day, I’ve always been asked for my ticket and absolutely no mention of the motorcycle. And because of all the rumours and even DIFFERENT versions of stories of WHY a foreigner cannot ride a (big) motorcycle into the Angkor park, I theorised that these stories have been conjured by local tuktuk drivers to dissuade tourists from exploring the archaeological park on their own instead of using their services. 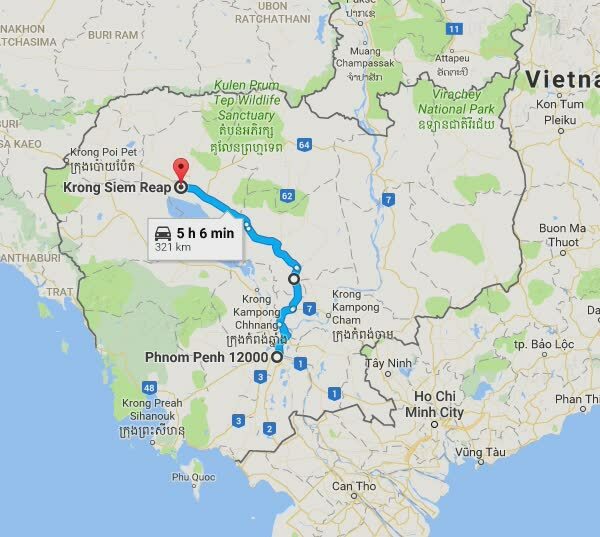 Even 2 of my hotel staff gave me 2 different stories on separate occasions – foreigners cannot drive or ride into the park, and big bikes cannot go in, only small motorcycles. 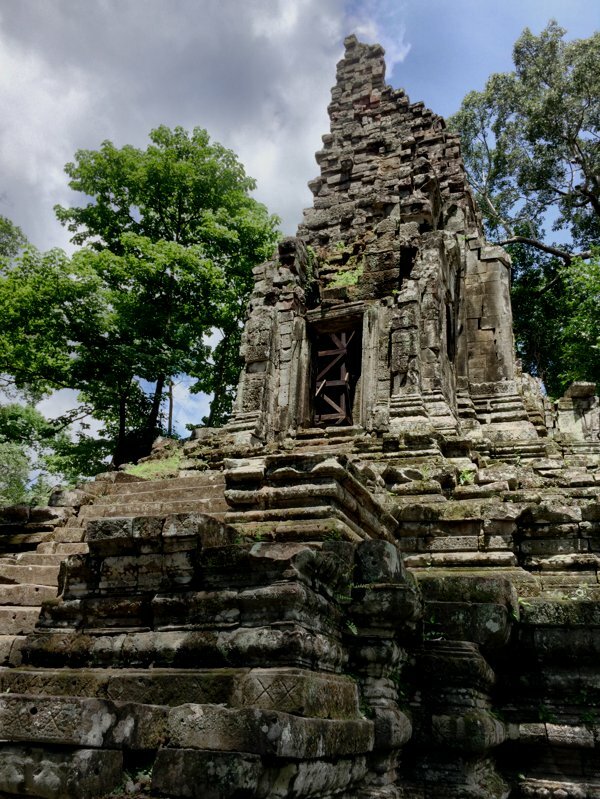 One of the towers in Angkor Wat. 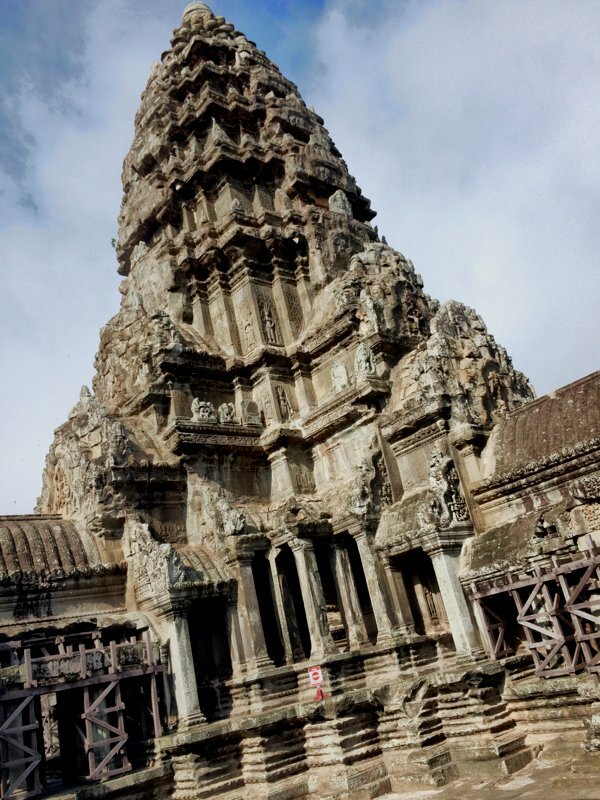 The near vertical climb of the Bakan tower within Angkor Wat. They limit the number of visitors up there at a single time by issuing passes. The view at the top of the Bakan. Detail on a stone wall. 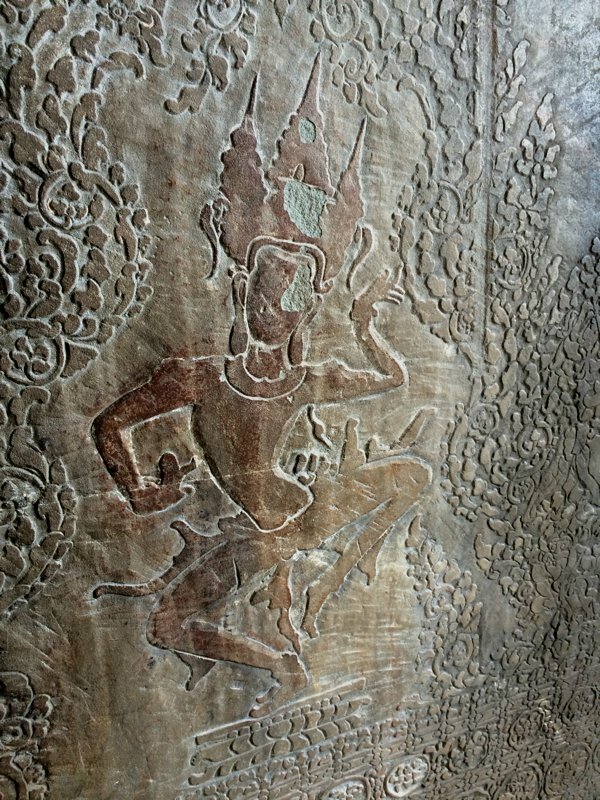 Decorations like this fill the walls of Angkor Wat. 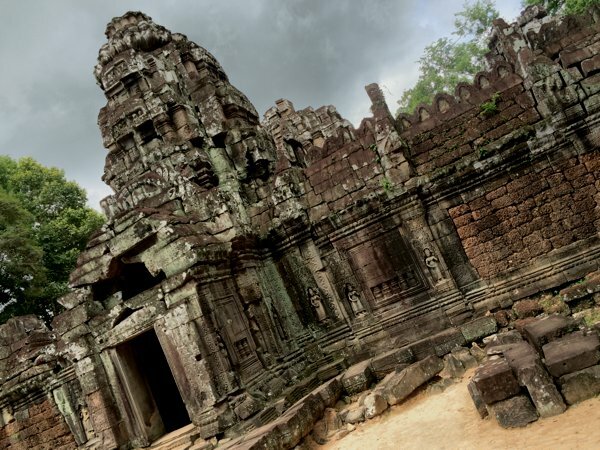 Even with modern day laser printers, it would take a considerable amount of time to cover all the walls of Angkor Wat. I cannot imagine the amount of human labour expanded back in those days to achieve these results. 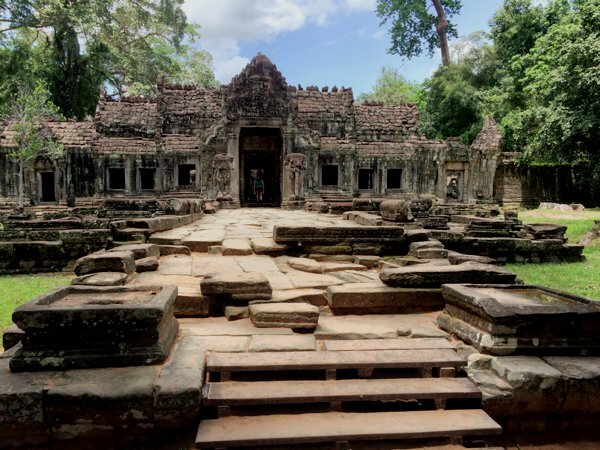 Temple within the Angkor Wat compound. There is a “big loop tour” and “small loop tour” around the archaeological park. With my very own transport, needless to say, I did the “big loop”. 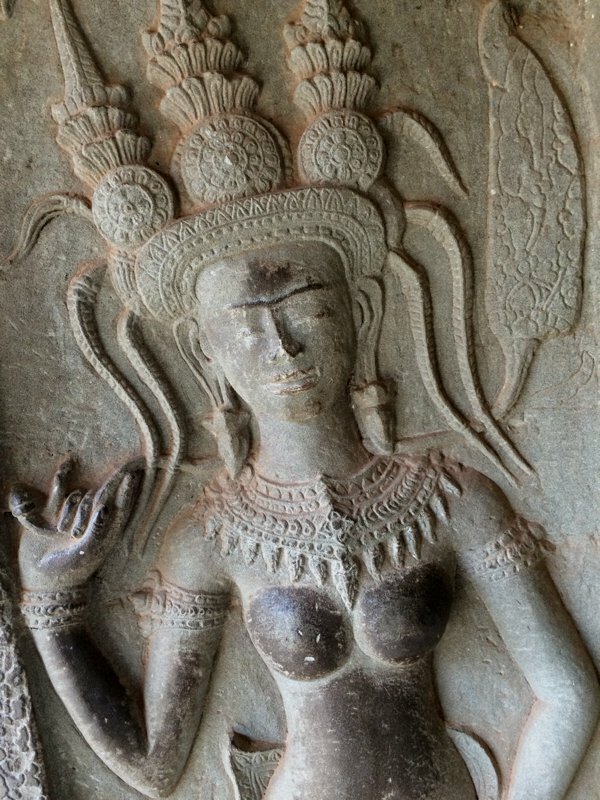 Over the next few pics, I’ll try to recall as much as possible which temples or sites they were taken from. Because quite honestly, after awhile, they all looked equally beautiful and I started to not keep track of the names of the places and just enjoyed myself. 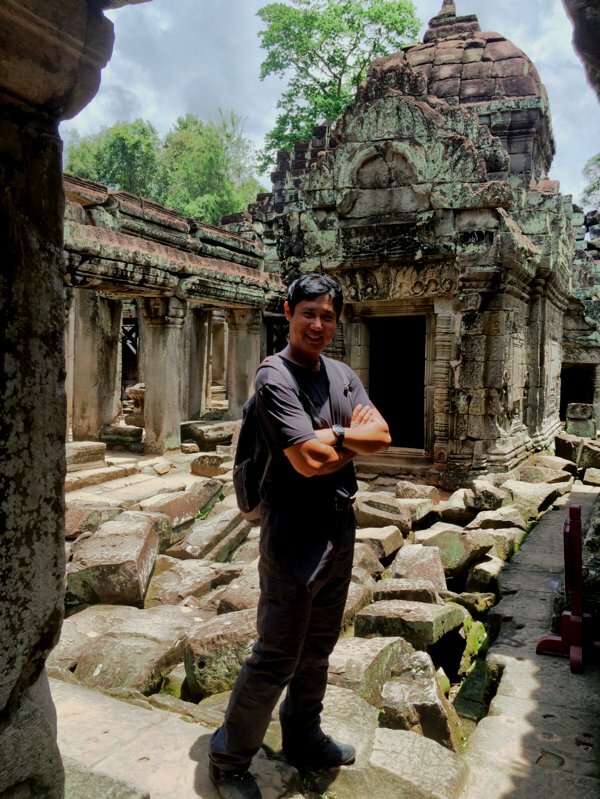 Me and some Angkor structure along the way. 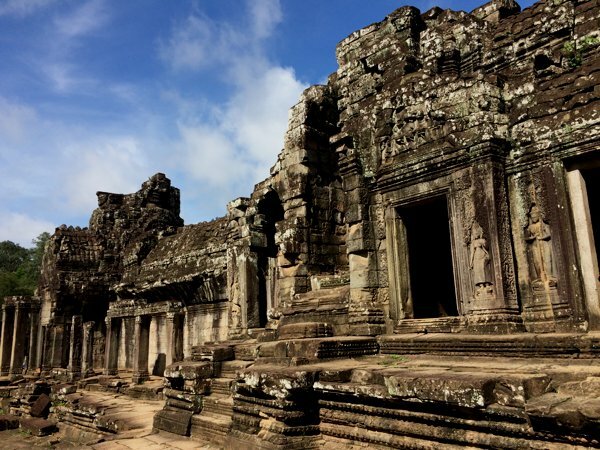 Entrance to Bayon Temple. Obvious restoration works going on to the right side. Inside the Bayon Temple, I think. I think the 3rd guy from the left has the nicest looking face. The rest are just old. Very, very, very old. Baphuon Temple from the main walkway. This place is so ancient that trees were growing around the stone walls. Oh, I met these sweet couple from Malta! Like Singapore, Malta is a tiny independent state / country / island – about half the size of Singapore, actually. These 3 trees seem like they were previously cut down but were really determined to live on! 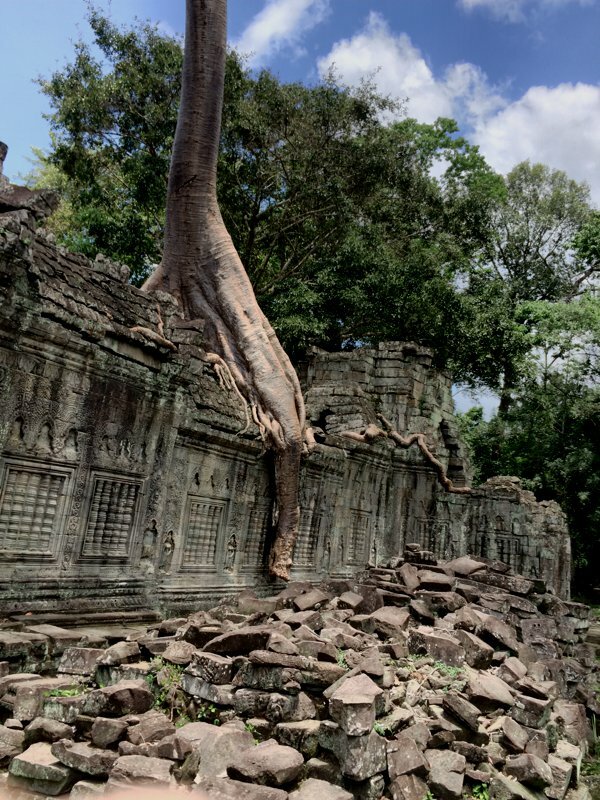 The three trees survivors – truly inspirational! 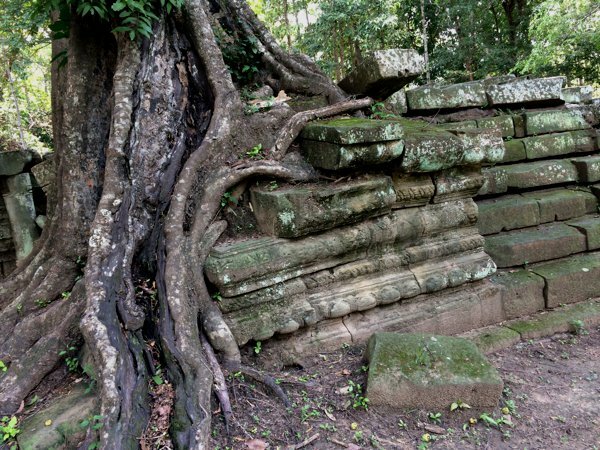 A monument in Angkor Archaeological Park. 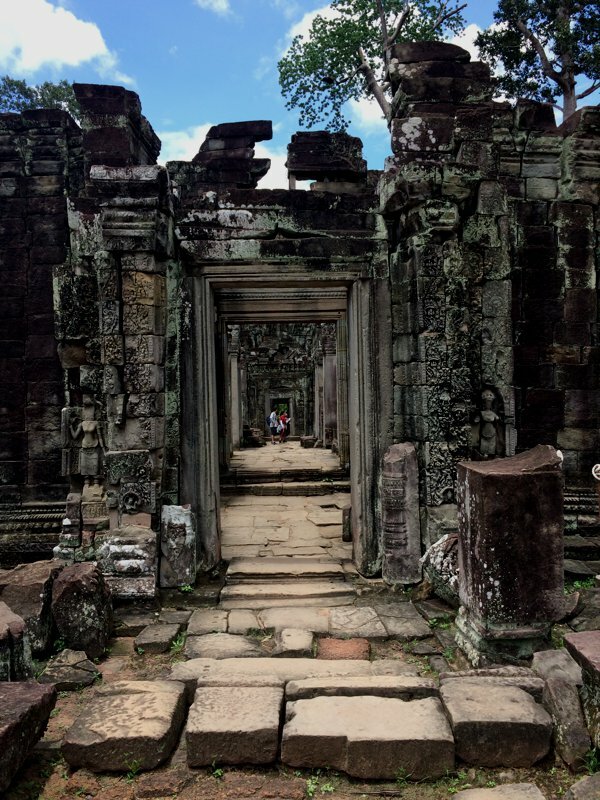 Walkways like this with decreasingly smaller doorways leading into the centre of the temples are common here. They’re intentionally built this way to force visitors to bow as they approach. Not just a wall-hugger, but a ROOF-hugger tree! It just awes me to think that this tree started off as a tiny plant. This tree owns the entrance doorway. Pay toll please. 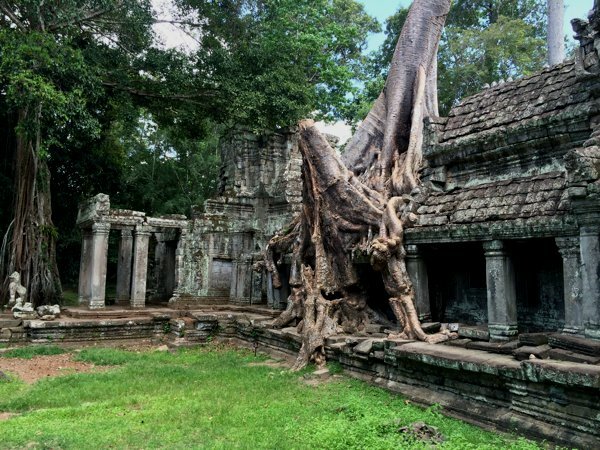 This is not my first visit to the Angkor park. I was here in 2007 and remembered the place quite differently. There are certainly ALOT more tourists now. 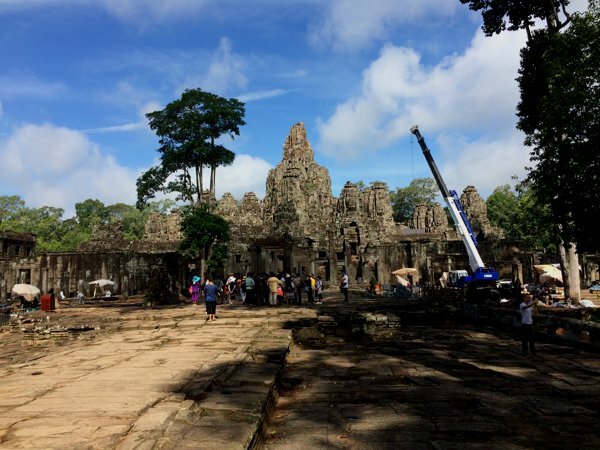 In fact, Angkor Wat itself was swarmed by tourists when I visited in the morning. And definitely alot more restoration works going on – which is a good thing. 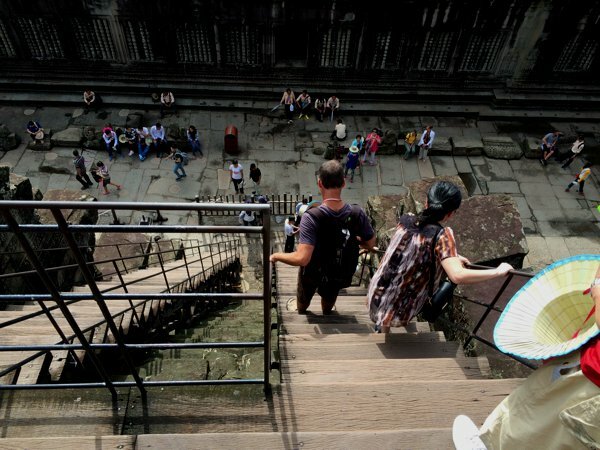 I recall that back in 2007, tourists were allowed to climb up most of the monuments (at their own risk, of course) via the original stone slabs steps. No hand rails. 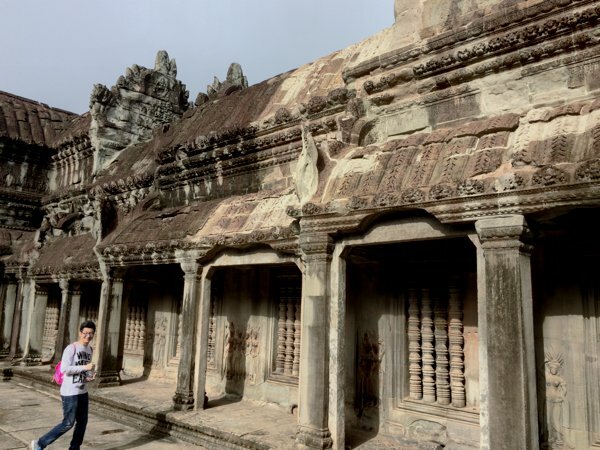 Today, many of these original stone slabs have been overlaid with wooden plank steps and metal handrails – possibly in attempt to preserve the original stone structures and also provide an additional layer of safety for the visiting tourists. Hello again, and goodbye, Angkor Wat. Hey Phil! Thank you for dropping by! Ah! Yes, I *did* sign up at RideAsia.net some time back but never got to posting there. I think the forum was erroneously flagged as a phishing site by google and Safari was giving me a hard time navigating the site. I’ll probably try posting it there again when I get the chance. Is that phishing issue resolved already?